Why is people so afraid of anesthesia? 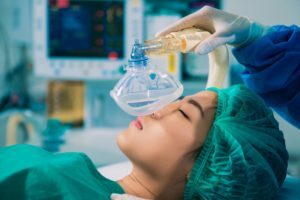 Are you afraid of anesthesia? In the first place, in our clinic everyone is friendly and kind. In the second place, our dentists are highly prepared. In third place, think about all the good things you will get above all the bad things you imagine. The fear of never waking up again from the procedure, consequently the fear of dying. The fear of having pain, due to the failure of the anesthesia. The fear of having an accident outside, due to the effects of the anesthesia. The bad main feelings comes from an imaginary feeling of dying after losing consciousness, patients think they are not going to open their eyes because of the effects. Or the bad feelings comes from a natural fear: Pain. People are also scared that their dentists loses control over the procedure, that is why the anesthesia is associated with a “temporary death” by some people, but what most of them do not know is that every dental procedure is supervised. Some people also think that anesthesia does not work in the same way with them, this is the consequence of a failed procedure in the past. If you are about to have your first time with anesthesia or if you have had bad experiences in the past, you have to know that there is nothing to be afraid, because things do not happen twice, here you will be surrounded by experts. Do not feel ashamed to tell your dentist about your fear of anesthesia, they will understand you. We recommend you to make an appointment in the morning, and schedule other activites, and here in Mexico we have many of them. How about a day in the beach? Or how about visit Mexican markets for souvenirs? Cancun for example has many adventure activities, you can go to the Riviera Maya and visit Xcaret or Xel-Ha. Actually, Cancun is a place full of beaches and it is close to the most popular ecotourist theme parks. Talk to your dentist if you can listen to relaxing music during the procedure. Bring a company with you, it can be your partner or your family. You will need help to take you back to the hotel. And at last but not least, remember all the food you will finally eat again, and in this trip to Mexico, you will be able to taste delicious tacos, empanadas, tamales, moles, pozoles, guacamole, panuchos, spicy food and sea fishes of all kind. And when you return back home you will have a shiny and happy smile. It is our job to offer the best dental procedures. Our clinic have the high-quality instruments and state-in-the-art facilities. We have a prepared and kind work team full of experience. If I still have all my teeth, can I get mini implants? Can bruxism affect my dental crowns? How can soda affect my teeth?